Evidence of a little-remembered attempt by Russians to gain a foothold in Hawaii between 1815 and 1817 can still be found in the remnants of an old fort alongside the mouth of the Waimea River. Though today the site is little more than jumbled red rock walls hinting at its former layout, an irregular octagon guarding entrance into Kauai via the waterway, it once was the site of grand plans to use Kauai as a permanent provisioning and trading station for the state-sponsored Russian American Company. 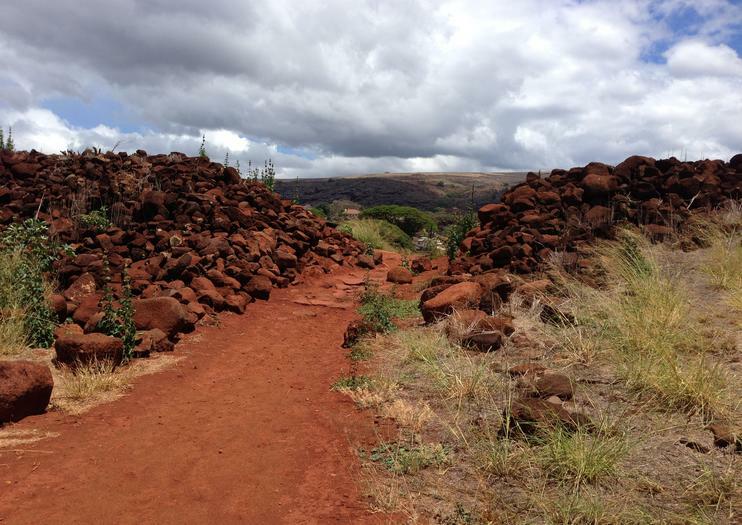 With outer rock walls constructed from ancient heiau (Hawaiian temples), the fort once included residences, a chapel, gardens, a trading center and the main fort building. Visitors can explore what’s left via a self-guided interpretive tour following signage with drawings of how the area once appeared. Here, Dr. Georg Anton Schäffer, sent to retrieve lost cargo from a wrecked Russian American Company ship, overstepped the orders of his mission. Schäffer instead built the fort complex, befriended Kauai’s chief, set him against the newly instated Hawaiian King Kamehameha and secured a sandalwood monopoly for the company. When Mother Russia learned of Schäffer’s actions, however, she disapproved. Russia didn’t want to become embroiled in the already complicated politics of the islands; they just wanted their cargo back. So, Russia summoned Dr. Schäffer home, leaving the fort to be claimed by the Hawaiians, and, later, after the dismantling in 1864, the elements. The remains of the fort—within the larger Russian Fort Elizabeth State Historical Park—are located off Kaumualii Highway (named for Kauai’s last king and the man Dr. Schäffer befriended) on the river’s eastern bank about a mile south of Waimea proper. The site has a small parking lot and is open daily during daylight hours. If visiting during peak sun, bring sunscreen and a hat; the area is exposed with little shade. Experience the majesty of ‘The Grand Canyon of the Pacific’ on this full-day tour of the Waimea Canyon and highlights of Kauai’s southern shore. Peer into the cavernous red expanse from the best vantage points, and learn how the canyon was formed by thousands of years of erosion. Along the way, see other natural and cultural attractions including the Spouting Horn blowhole, Waimea Town, the Hanapepe Valley Lookout, Fort Elizabeth and old Koloa Town. Explore the best of Kauai’s diverse South Shore in the comfort of a small group, and still have most of the afternoon free to spend as you choose. It’s an area rich in history and legend, from historic Russian Fort Elizabeth to the Spouting Horn Blowhole and lush Hanapepe Valley. See if you can recognize the grand scenery from many Hollywood movies, and finish with spectacular views into the red cliffs of Waimea Canyon.